Big Brother Spoilers for today.. Dina and Tamar are nominated. Kato wants to take out Ryan first followed by Joey. Ryan – That’s only four votes that they have … Well NO Kato can’t vote because he’s HOH..
Joey – Veto challenge.. Veto Ceremony and Eviction..
Tom – I don’t want him gunning for me..
Tom – A lot of is it just thoughts..
Tom – I talked to lolo last night.. I said you know tomorrow we should think about asking RIcky about being part of our alliance and if he says no than we know there’ a problem.. right.. we could switch the derision we are making. If he says yes than maybe we’re ok..
Tom – Between you and me not to leave this room.. again I don’t like saying it he’s the biggest threat not Joey not Dina.. .
Kato says the next people they go after is Joey and Ricky after this week taking out Ryan. Tom says Ricky smiled at him this morning and gave him a good morning nod. Kato – people are assuming..
Tom – Ricky can do the same thing, anybody can anybody that knows about the four of us. ..
Tom – and I’m like.. I could go to Dina and say I’m a bit mad at Kato because I told him I didn’t want him ti out yo on the block and we’re not really talking right now..
Tom – Dina will probably tell everybody..
Tom – I could probably go out there hang with Joey and Ryan, Dina all day and at some point go like Listen I don’t know what is going around in here..
Kato – no way they will buy it .. IT’s too late. Ryan is worried now because he knows he has to win the veto .. If Ryan wins Veto uses it on Dina Kato has to thin of a target. Tom – you know my feelings.. we have two primary targets. Tom goes on about Kato having one shot and if Ryan wins the veto he’s got to take it against Ricky. Natalie – the shift is so real it’s crazy.. ohh well we’re save..
Natalie – It’s so obvious to me that if Tamar is able to pull thru she’s going to team up with them.. why is she going over stuff with Kandi and not us. Joey – you’re move my move.. head to head competition..
Kato – I’m going to think about it.. I do wish in my heart everything that happened that very first day was different.. things happened.. I was totally alone. Joey – you don’t want Spicky… or super low energy.. I want predictability.. temperament..
Kato – that was tough.. that felt like the last plee of knowing he’s going up or Ryan’s going up… and I’ve thought about it I’ve really thought about it and…. ummm I’m not going to a stray my group that I committed to.. 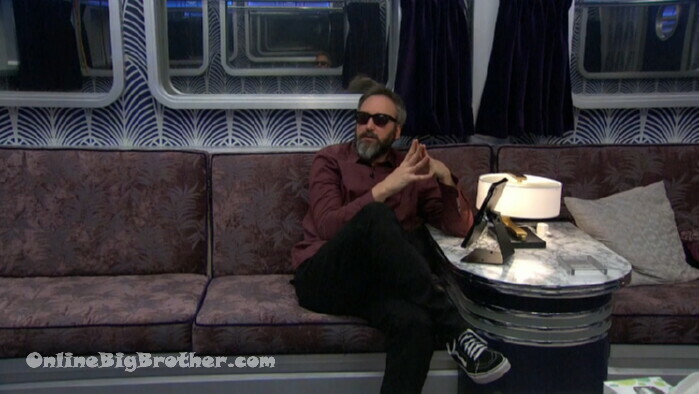 I can’t do it I can’t do it I have loyalties to my group..
Kato – I’ve made up my mind of who is with me I respect it and they respect me for doing what I’m doing..
Kato says Joey’s plea was Good..
Ricky brings up Jon giving him the same thing. Kato – he brought up wanting the 5 most fun people..
Rick – doesn’t matter.. Tamar will be mad.. 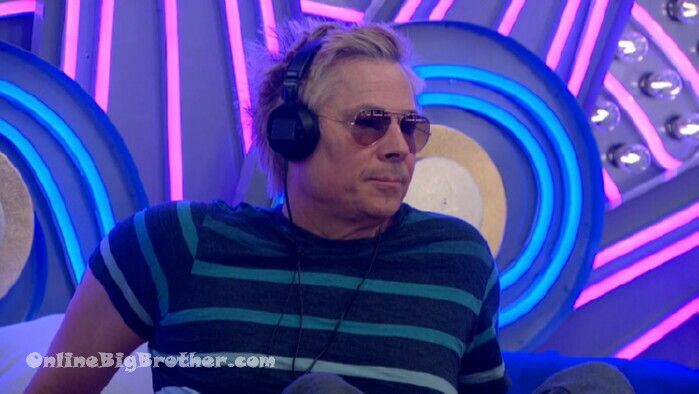 I would pick Tamar because She will be more useful..
Tom points out that people have been in good spirits..
Tom – so have they been trying to talk in different ways..
Kato – they kinda made that face to me. Tom – nobody is going to change there mind right..
Kato – No, the white towel has been raised. 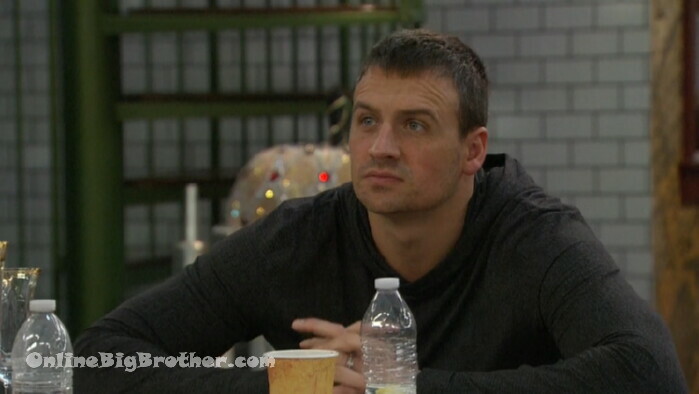 Tom – I heard Ricky tell Dina he’ll give her the veto..
Ricky – Do yo think if Ryan gets backdoored they’ll know the deal? 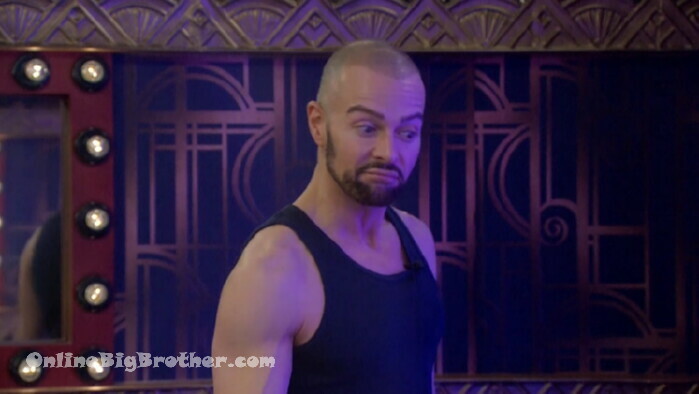 NAtalie – if he gets backdoored and put up he’s not going to campaign..
Natalie says if Joey and Ryan really didn’t give a f* like they say they wouldn’t have gone and made a pitch to Kato. 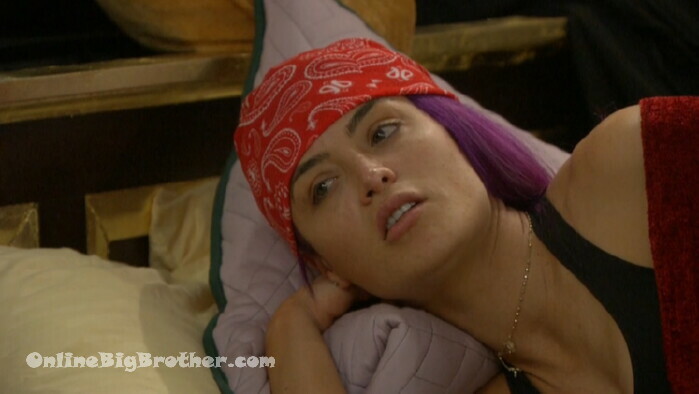 Natalie – look at how different the house is..
Ricky don’t leave hi min a room with them..
Natalie – he’s solid with the five /.. we’re five until the wheels fall off..
Whoa! I have to talk to folks and convince them to vote a certain way, make sure I’m safe, keep my ears open for information because people are lying to me?! What kind of craziness is this? Well, Joey, this is Big Brother and it’s a multiple faceted competition involving multiple styles of comps (sort of), a huge social aspect, some strategy, some luck, and production interference or twists as they call them. Watch a few episodes (just not season 16 or 19) before signing up and it’s pretty clear. Something tells me Ryan or Joe will win veto. Why do I always have the niggling feeling that the bags of names are loaded with who production wants? Nah,,prolly not. Even so…I want Ryan and Joe to stay. Ricky, whom i like..is just not around much. Kandi is rather blah. It will be so boring if it’s Lol, Nat, kato and tom all the way. In any event..I like Ryan. he’s matured…taken responsibility. Joey has grown on me a bit. He’s really a sweet guy. I did laugh with Ryan last night. He was invited to some sports gig. Football I think. He says he zoned out..staring at the crowd which was full of sports celebs. It was a live commentatation show. Silence. The Auburns were not even playing. LOL. Ryan, telling the story of his embarrassment..laughed at himself. Joey says..* Oh, they can block that *. No, says Ryan..* It was LIVE !! The alliance are pushing for Ryan and Joey to go. BUT..they don’t get that the comps are mental as well. And the luck factor. Sure, Ryan is a great swimmer. Doesn’t mean he’s strong in other physical comps. Joey is strong…but not in the way LOL and Nat and Ricky are. Ricky is the dark horse. But I think he REALLY likes nat and will go which way she does. I hope NEM/LoLo/Ricky/Tamar is split up soon. They are getting way to powerful and could end up stream rolling to the end. I wish that Kato could have a clue that he’s probably next in their hitlist along with tom after joey leaves. At this point I hope there’s a twist that will make those 4 target each other or at least get one of them out. I feel that Kato is overly concerned about how he comes across to America. He thinks he has to come across as this happy feel good, loyal guy. I get that he has had a very hard time because of the O.J. trial…and he has had to feel the brunt. But..it was 25 YEARS ago! He would be better off being a savvy, cool player. Not this riddle kind of talk. Be more on point. He becomes hesitant…friends, after the show etc. Ryan..who never watched the show..is clueing up quite fast. Joey hasn’t shown a very competitive streak yet. Ricky is going to bed right on cue. 10 o’clock. I wish he was more involved. I like Kato. He’s good natured, kinda awkward, and tells the best dad jokes. Natalie seems to be one of the people giving everyone advice about how to play the game. Is she considering Ricky part of her alliance? When I read this I thought, ..hope dumb is she. Kato can’t vote so that leaves her, Lolo, and Tom.